It was horrible—hideous beyond all articulate description… one moment I was plunging agonizingly down that narrow well of million-toothed torture, yet the next moment I was soaring on bat-wings in the gulfs of hell; swinging free and swoopingly through illimitable miles of boundless, musty space; rising dizzily to measureless pinnacles of chilling aether, then diving gaspingly to sucking nadirs of ravenous, nauseous lower vacua. . . . 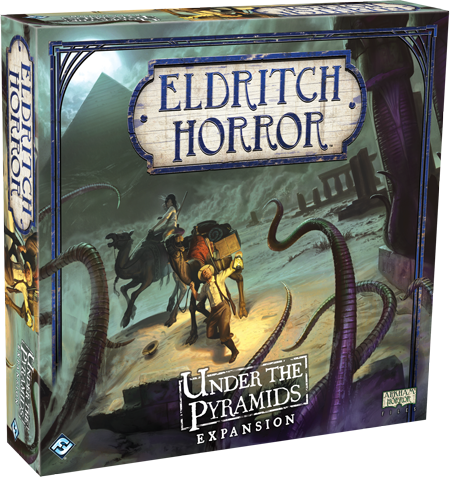 Under the Pyramids, an expansion for Eldritch Horror that's now available at local United States retailers and in our online store, opens up six new locations throughout Egypt for you to explore. Your adventures are not, however, limited to the timeworn temples and tombs of Egypt. Deep in the wilderness dwell the grotesque and malicious children of a creature far elder than the Dark Pharaoh: Abhoth, the chaotic source of all uncleanliness on Earth. 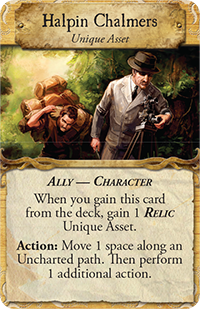 Our previews have so far delved into the mysteries of the Dark Pharaoh, visited the six locations of the expansion’s Egypt side board, and introduced some of the investigators who are now joining the struggle against the Ancient Ones. 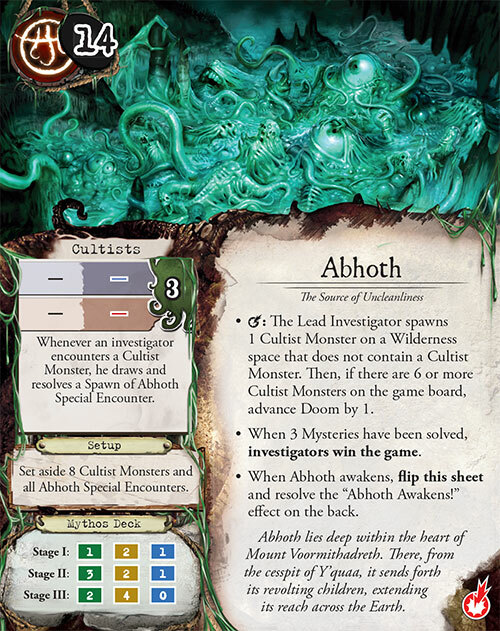 Today’s article lays the groundwork for your investigation of Abhoth, and your battle to keep this horrid, protean behemoth from awakening. The source of uncleanliness, Abhoth itself , lurks in a dank cavern in the distant realm of Hyperborea. It is an amorphous, oozing grey mass from which disease and all other forms of abomination are birthed. 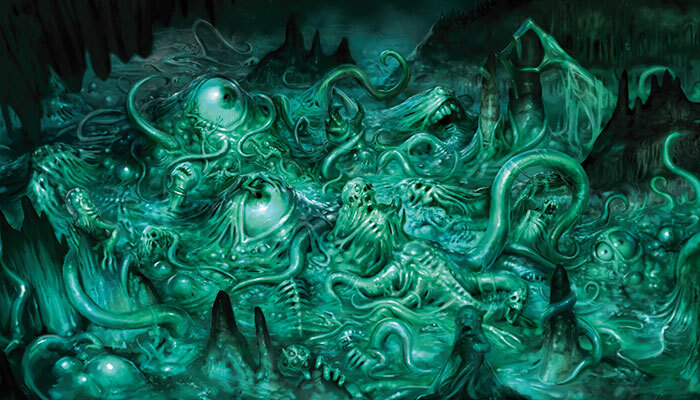 Terrible monsters—creeping blobs, deformed animals, misshapen mutants, infectious slimes—constantly form within Abhoth’s body before emerging to inhabit caves deep in Earth’s wildernesses. They surface only to feed and to do their sire’s awful bidding. No Cultists devote their lives to such an abomination. 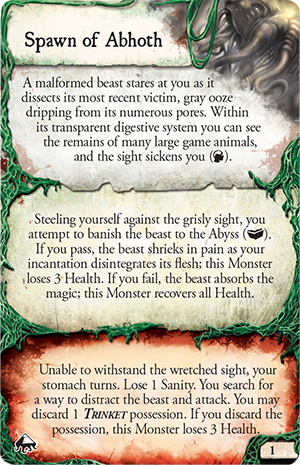 Instead, when Abhoth is the Ancient One, the Cultist tokens represent Abhoth’s incomprehensible spawn, whom you battle through a Special Encounter. 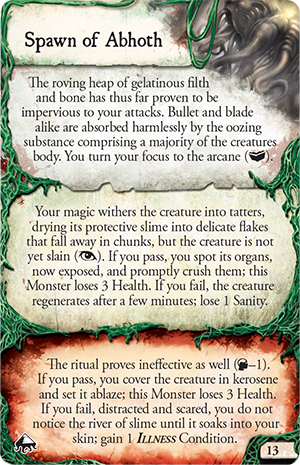 These spawn each have a health of three, and while succeeding in the encounter you draw is often enough to defeat the spawn, you may use other means, such as spells, to kill it. However, in order to banish such a creature to the Abyss, you may have to test your will as you watch it digest its victims. You may try to fight one with bullet and blade, only to have its oozing substance easily absorb your attacks. With every reckoning, another one of Abhoth’s spawn appears in some savage, unpopulated place of the world. If six or more of them are active at once, Doom advances as Earth succumbs to their terrible foulness. 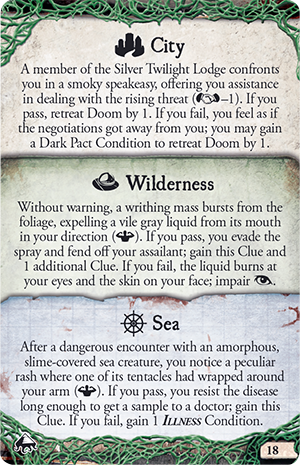 To defeat Abhoth itself, you must solve three of its mysteries. 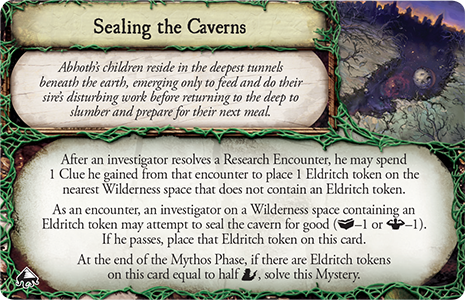 You may discover that the first step to subduing Abhoth is preventing his gruesome offspring from coming out of their subterranean holes by sealing the caverns deep in the wilderness. Traces of Abhoth’s influence and clues to fighting him may be found far out at sea or in old tunnels beneath bustling modern cities. The inhabitants of those cities may also have fallen prey to Abhoth’s influence. Even from wintry and distant Hyperborea, Abhoth can use its telepathic powers to cruelly twist human minds. By traveling to the Earth’s metropolises and freeing these psychic slaves to filth, you’ll solve one of the mysteries necessary to stop Abhoth’s restless activities. 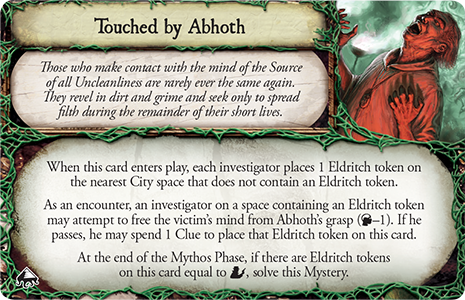 Hopefully, you’ll meet some of the rare mortals whose minds can withstand Abhoth’s powers and gain their assistance. 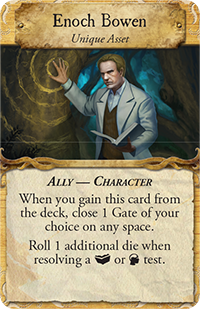 The renowned occultist and archeologist Enoch Bowen can strengthen your resolve and contribute to your understanding of arcane lore—which he can use to close one single Gate. The author and mystic Halpin Chalmers can ease your treks into the wilderness where Abhoth’s spawn tend to dwell. 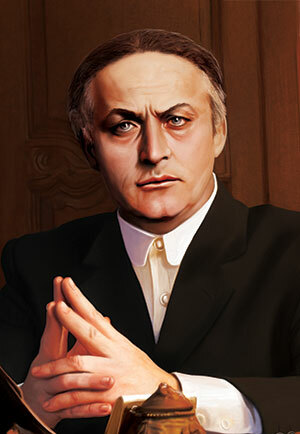 Wherever you travel, the magician, occultist, and escape artist Erich Weiss can keep you from becoming Delayed or Detained. His help also enhances your powers of observation and your knowledge of lore. If Abhoth awakens, he will unleash psychological corruption, ravenous monsters, and disfiguring diseases across the Earth. 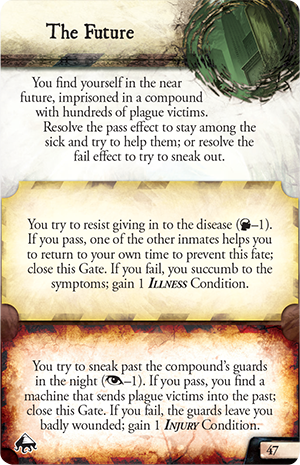 Under the Pyramids even offers you a glimpse of a dark future in which Abhoth has risen, and hordes of helpless plague victims suffer in wretched prison camps, kept away from the few healthy members of humanity left. If the Dark Pharaoh should return from the dead and regain power, a different misery awaits: global slavery to a tyrannical and sadistic ruler. 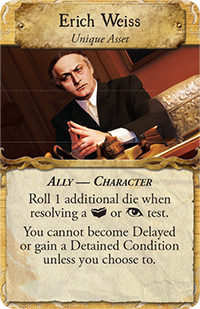 The world is depending on you and your fellow investigators to prevent both futures from happening. 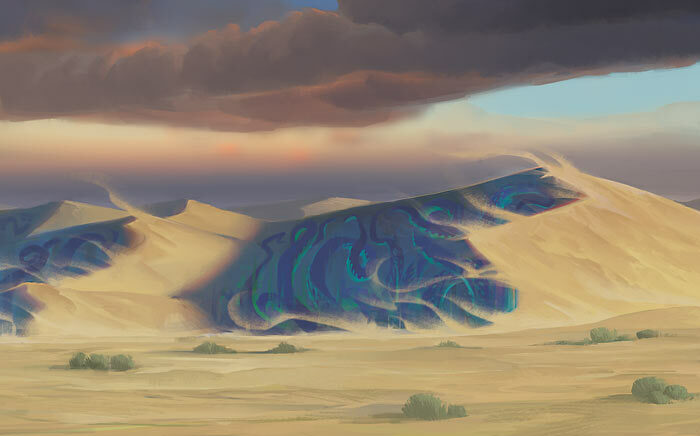 Prepare explore Egypt’s ancient mysteries and battle Abhoth’s spawn in the trackless wild. Prepare to fight the future. 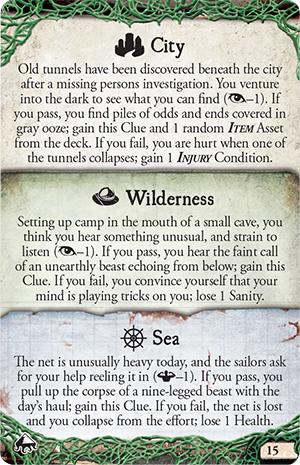 Download the rules from the Eldritch Horror minisite and pick up Under the Pyramids from your local retailer today!